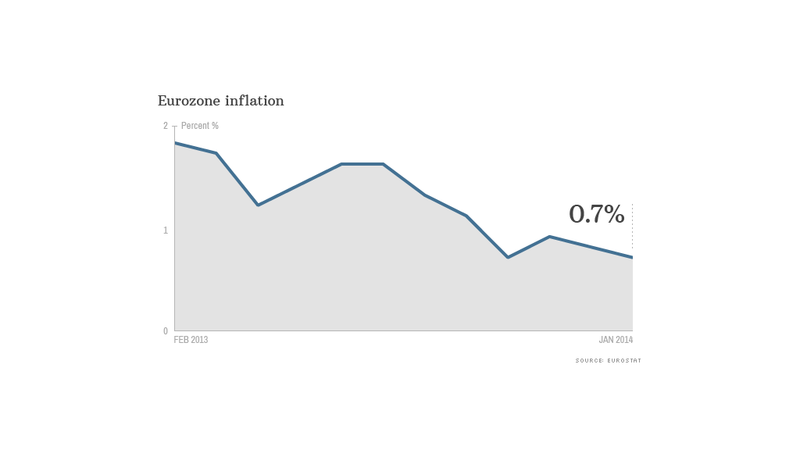 Worries about deflation could lead to a rate cut. Another interest rate cut in Europe could be just around the corner as the risk of deflation rears its ugly head again. The first official estimate of eurozone inflation in January was a weaker-than-expected 0.7% -- the same level that prompted the European Central Bank to cut rates in November. Consumer prices rose by 0.8% in December. The weaker January number "puts significant pressure on the ECB to take further stimulative action at its February policy meeting next Thursday," said IHS Insight's chief European economist Howard Archer. Cheaper energy was largely to blame, but the stronger euro has also been pulling import prices down, economists said. Europe is slowly recovering from the recession triggered by its debt crisis. The International Monetary Fund expects the 18-nation eurozone economy to grow by 1% percent in 2014, after shrinking by an estimated 0.4% last year. But unemployment remains stuck at a record high of 12%, with businesses reluctant or unable to invest. Lending to households and companies is very weak, partly because the region's banks have yet to regain full health. IMF Managing Director Christine Largarde warned last week that a shock could turn Europe's low inflation into deflation -- defined as a broad-based price decline that can lead to a slowdown in consumer spending. The IMF has also warned about the risks posed by the Federal Reserve's gradual withdrawal of cheap money. Emerging market currencies have been on the ropes this week, forcing three central banks to hike rates -- moves which could contain the seeds of a shock if growth suffers and chokes off Europe's export-led recovery. Speaking at the World Economic Forum in Davos last week, ECB President Mario Draghi repeated a pledge to use all the tools at the bank's disposal should the medium-term outlook worsen. The ECB's main refinancing rate stands at a record low of 0.25%. Archer said he thinks the ECB was more likely to resist pressure to hike rates next week, given survey evidence that points to stronger business activity and rising confidence. But it may just be a matter of time before Draghi acts again, either by reducing the main rate further, cutting deposit rates into negative territory -- in effect charging banks to keep money with the ECB -- or possibly by buying packages of bank loans issued to firms and households. Draghi has indicated that a program of quantitative easing as pursued by the Fed, Bank of Japan and Bank of England, would not be allowed under EU law.